Featuring the poem “Voyage” by former U.S. 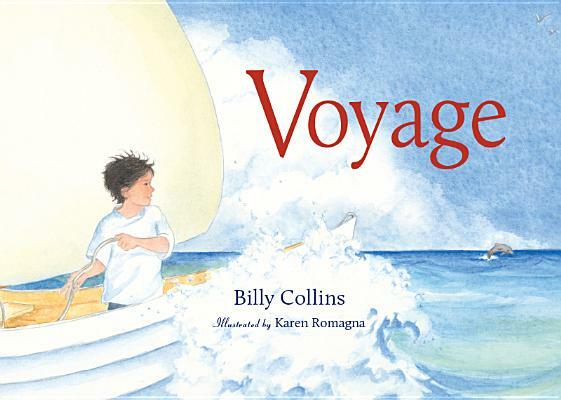 Poet Laureate Billy Collins alongside gorgeous pictures by Karen Romagna, this hardcover picture book is a great gift for any young person who loves, or lives, by the sea. This book is sure to capture the imaginations of young readers. A charmingly illustrated poem by former U.S. Poet Laureate Billy Collins takes us on a journey that features magical transformations and makes a nautical adventure out of the act of reading. The interplay between the pictures and the poetry dramatizes how reading can transport us from our own familiar world into the fantastic world of a book. The boy in the boat stands for every reader and every child. Billy Collins is the author of a dozen books of poetry and was called America's most popular poet by the New York Times. He served as U. S. Poet Laureate 2001-2003, and the New York Public Library named him a Literary Lion. This is his first book designed for children.Karen loves the ocean so much that as a little girl decided she would be a mermaid. That didn't work out. Instead she followed her other love, art. Karen and her family live in historic Clinton, New Jersey. They vacation every year at the Jersey Shore where Karen spends most days on the beach painting... Hoping to one day at least see a mermaid! Voyage is Karen's debut as a picture book illustrator. Billy Collins is the author of a dozen books of poetry and was called America's most popular poet by the New York Times. He served as U. S. Poet Laureate 2001-2003, and the New York Public Library named him a Literary Lion. This is his first book designed for children.Karen loves the ocean so much that as a little girl decided she would be a mermaid. That didn'twork out. Instead she followed her other love, art. Karen and her family live in historic Clinton,New Jersey. They vacation every year at the Jersey Shore where Karen spends most days onthe beach painting... Hoping to one day at least see a mermaid! Voyage is Karen's debut as apicture book illustrator.